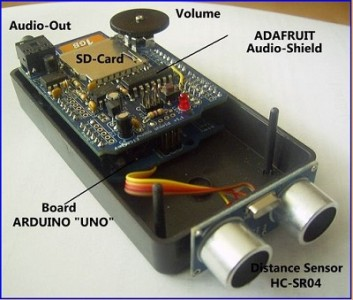 Voice Based Ultrasonic Sensor Using Arduino #arduino « Adafruit Industries – Makers, hackers, artists, designers and engineers! Embedds has posted this useful project for making an ultrasonic voice-based sensor. Everyone must have seen those creepy parking sensor that are attached to a car back and gets activated when the driver puts the reverse gear. The sensors sends out the ultrasonic waves and detect the distance and notifies the driver when the distance is too less. It’s a similar project built by using an Arduino and a HC-SR04 ultrasonic sensor which are popular sensor to detect proximity. Apart from it uses an audio shield which has pre stored audio messages that has spoken value between 10-100 cm with a resolution of 5cm. The audio signals or the voice signals are stored on an onboard SD-card which is integrated in the Audio shield and also has support for Audio output. It’s typically designed to use with as a parking distance. Overall an excellent project which utilizes the audio shield to full extent but integrating it real time can be little tricky and will depend heavily on type of vehicles. However this type of project can be used in AGV’s with a little modification.